At Shore Resort Property management we know Wildwood. Let us guide you in finding the right location and activities to create the perfect vacation for your family. Wildwood offers something for everyone and we have listings for family friendly oceanfront motels, efficiency units and vacation homes to meet the needs of every couple or family. Whether you are looking for a Wildwood Crest vacation rental, North Wildwood rental, or a Diamond Beach condo rental, you can find the right accommodations for your vacation on our online rental site. We have listings for oceanfront hotels, condos and vacation rentals with amenities that include pools, internet access and beachfront locations. 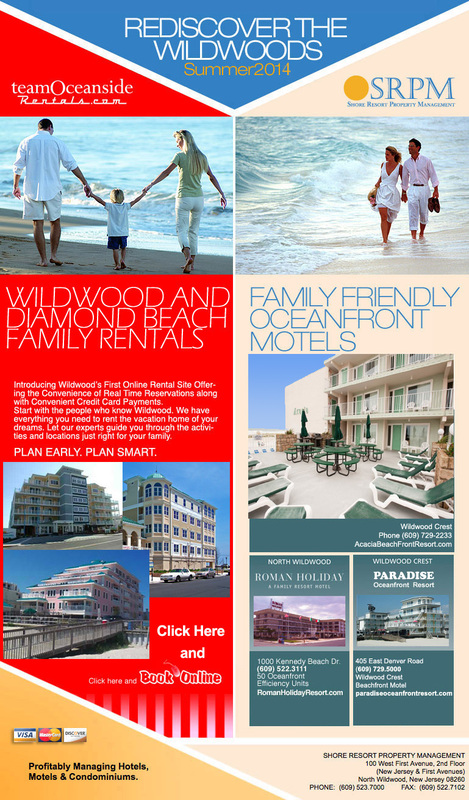 Browse our website to find Wildwood condo rental and Wildwood Crest beachfront rental properties. Our extensive listing of properties allows you to find the perfect Wildwood vacation rental in the area you want to stay. Not sure about the area that would be the best fit? Give us a call and one of our Wildwood beach rental experts will be happy to help you find the right place for the vacation of your dreams. Click through the listings on our website to see pictures and read descriptions with the features of each property to help you select the Wildwood vacation rental that best fits your requirements. We offer the added convenience of easy online vacation planning. You can reserve your Wildwood beachfront rental in real time on our rental website and secure your reservation with a credit card deposit.